Adam (Tom Hiddleston) and Eve (Tilda Swinton) have been married for centuries and even though it is clear that one cannot live without the other, Adam lives in Detroit, Michigan while Eve lives in Tangiers, Morocco. As Adam, who is a reclusive musician with fans who are desperate to find out more about him, becomes increasingly depressed with the direction the world is heading in due to the human race, Eve agrees to join him in Detroit to calm his emotions. The two live a seemingly idyllic life together until Eve's disruptive and meddling younger sister, Ava (Mia Wasikowska) arrives from Los Angeles to spell trouble. Only Lovers Left Alive gives a completely different take on these immortal beings without neglecting the traditional features one has come to associate with them. Adam and Eve are indeed creatures of the night as the whole film takes place in their waking hours after dark, they of course drink blood and they possess all the physical features that vampires are known for. Yet these traditional aspects are adjusted for the present times. For most of the characters, their way of attaining blood is a lot less barbaric than it was in the past and they carry their feed in a flask, and they all wear sunglasses when venturing into lighted spaces. The characters also talk about times past mentioning such historical figures as Shakespeare and Einstein, but they are not removed from the present. In particular, Adam longs for the past, but he is very much caught up in the present with his music. There is an incredibly beautiful scene in which Adam is in his house filled with guitars and modern day instruments when he picks up a violin and starts to play. This vision of Adam playing the violin is perhaps the most classic and traditional image of a vampire in recent times and is as refreshing as it is nostalgic. Jarmusch has successfully made the link between the vampire tales of old and the present resulting in the film being classic but modern. The production side of the film is near perfect. Visually, it is incredibly intriguing. The opening sequence of a 360 rotation of the night sky which becomes a vinyl being played and then turns into our first glimpses of Adam and Eve from above is the perfect beginning to an extremely atmospheric film. The location shots of both suburban after dark Detroit and Tangiers completely capture the essence of both cities and the cities themselves are seen from the most interesting angles, which are perfect for the characters. Every visual of the film carries a dark and mysterious feeling and it doesn't break this atmosphere for it's entirety. The soundtrack is also extremely fitting to the film. It adds to the overall atmosphere by being haunting, but also very laid back and cool. However one must not forget that Only Lovers Left Alive is first and foremost a love story. It is the story of two people who have been in love and married for centuries and have seen the world change together. They know what it takes to make a marriage that has endured for so long last and as a result are still very much in love. There is an overwhelming amount of chemistry between Tilda Swinton and Tom Hiddleston. Their timeless love radiates off the screen and the two work as one whenever they are onscreen together. 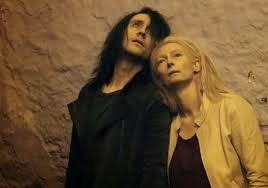 Swinton is wonderful as Eve and Hiddleston is so charismatic as Adam. He absolutely embodies the depressed character who is torn between his love for specific things in the present and his longing for the past. Hiddleston is the ultimate rock star. Only Lovers Left Alive is the type of film you really can't get enough of, and will still remain as intriguingly exquisite with multiple viewings.